Although I do like birds, I will never become a birdwatcher: I haven't enough patience for that. And I can imagine that in order to pry on birds you need to study a bit. How else would you recognize a bird? Lesvos is a birdwatch-paradise and I often see odd birds and then think: what can that possibly be? The flamingo is the easiest bird on Lesvos to identify. For that I do not need a book. Same for the Black Storks. They of course are easy to recognize, but are not easy be find. The real trouble starts when seeing a heron or a (white) stork. Sometimes, when driving with friends along the saltpans of Polichnitos, I say: “Look, there's a stork”, when, according to my friends, I am actually pointing out a heron. I have no idea what the small stilt-walkers are that roam the same waters. I have never studied the bird world and I rarely write about it. I did once write about those strange flamingos. And I was so surprised at finding a huge information board about the colourful red shellduck in the middle of nowhere in Palios, that I had to mention that phenomenon. As far as I know it is the only information board about a bird on the island. They should install more of those boards, especially along the saltpans on the island. I do see often seagulls and it seems that here on the north coast you can even spot different species like the Audouin’s gull, the Yellow-legged gull and the Yelkouan shearwater (this bird looks like a gull, but is not a gull). My intention now is to learn more about birds and so I have bought a book (only in Dutch: Vogels kijken op Lesbos [Watching birds on Lesbos] by Luc Hoogenstein), and hope that this will make me a bit wiser about the birding world. The book describes all the important birdwatch-places of Lesvos and also provides a list of what birds you can expect at those places. Very handy. But I think this is a book for the more advanced. I mean, I can learn to say all those names by heart, but how does such a bird look? It would have been better if each name was accompanied by a small picture. Now I have to go through the whole book hoping that there will be a photograph of the bird I have just seen. How do I find, for example, the little bird I saw with white spots on its sides? Even on the internet that will be a Herculean feat. Another bird that I see nearly daily is a crow. Well, that's wrong. The black birds here that sit on the electricity cables and scrabble around in the fields and the beach are not crows. It has taken me some time to decide whether that are crows, ravens or jackdaws. But I think they are jackdaws (corvus monedula), because they are partly grey and they are recognizable by their beautiful eyes with a yellow circle around the dark iris. Even though jackdaws are big birds, it seems crows are even bigger and ravens are as big as an enormous bird of prey. It is good that their family members Eurasian jays and magpies are so much coloured that they at least are easy to recognize. The big birding season is, of course, in the spring. But even during the past months I have seen lots of birds, sometimes very bold in stealing my fruit. Even though the crickets now sing louder than anyone else, you can still sometimes hear the song of a bird in the background. And when I go out for dinner, I am often confronted with birds flying over the tables. Tourists can be confronted by this phenomenon on the balcony of their hotel: a swallows' nest that, when birds are in residence, is at the end of a busy landing strip. (Old) Greeks think that dogs in the sea may dirty the water and – as far as I know – dogs still are officially not allowed to swim in the sea. But Greeks have no problem with birds pooping around their homes or in restaurants. You see, swallows bring luck and even prosperity when they choose your home, terrace or balcony to raise their off spring. The Greeks will watch over the nests, even though that most flying hours, made by the parents to feed their baby’s, go straight over the heads of the guests. I am not complaining: I think this birding thing is an entertaining performance and it makes you feel immediately at ease in the restaurant. I never realized that swallows are trekking birds and have a special place in Greek culture: not only do they bring fortune, they also are the announcers of the spring and they all should be back from Africa on March first. 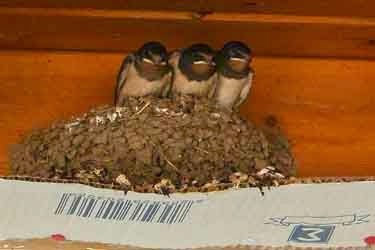 At least, that is the day in Greece that their arrival is celebrated and when children go around the houses with swallows made out of paper and sing songs about the spring and about swallows (Chelidonismata). I am always looking for new forms of income for the Greeks and that is why I was interested to learn which swallow nests are eaten in Asia. The artfully crafted nests here are made of mud, small branches, straw and whatever else keeps the construction together. Somehow, I could not imagine that these nests could be a new export product. And I was right, they cannot. In Asia there lives a kind of special swallow that build its nests only with saliva! I am not sure if I prefer to taste swallow’s saliva or a bit of mud. Also swallows are divided in different kind of birds. I did some study but am still confused. What the heck: if it has a forked tail it just is a swallow! I now will look for a book about birds on Lesvos that has a clear overview in photographs that makes it easy to find what bird you just saw. It must be a bird guide for beginners, with clear explanations about differences within species. Now that the heat has arrived and the sparrows fall off the roof (a Dutch expression meaning that it is very hot), it seems to me that it would be helpful to quickly identify which kind of sparrow you might have to resuscitate.